Watch this bizarre video footage of a man who was left with only half a head after crashing his car. 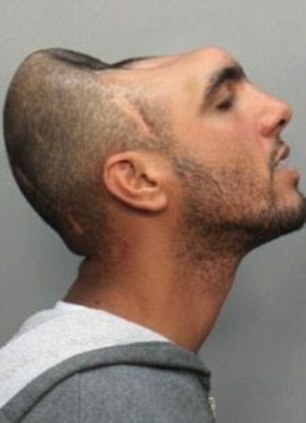 Carlos ‘Halfy’ Rodriguez from Miami, Florida lost almost half his brain and skull in a car crash after flying through his car’s windscreen and landing head-first on the road, while high on drugs. Amazingly he survived the crash thanks to the work of doctors who cut away large amounts of flesh and bone. He has now fully recovered although he is left with no noticeable forehead. Mr Rodriguez shot to fame two years ago after he was arrested for allegedly soliciting prostitution. When police originally released mugshot photos of Rodriguez, people thought the bizarre images of him with what appeared to be only half a head were fake and had been photoshopped. But in this shocking video you can see that the man really does only have half a skull. The Freaky loves strange medical stories, here are some more freaky medical conditions.